Zenato is a historic and well respected name in Northern Italy’s Valpolicella region. Sergio Zenato started the winery in 1960 and today the family tradition in winemaking is carried on by his children Alberto and Nadia. 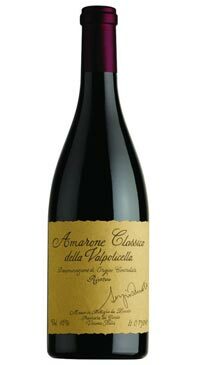 The estate produces a range of white and red wines, however, its Amarone wines are the most complex and powerful that develop amazingly with time. The Zenato Riserva Sergio Amarone is a wine of class that is only produced in the best vintages. Corvina grapes, with the addition of some Rondinella and Sangiovese grapes, are selected vine by vine from only the oldest vineyards in the Classico zone of Valpolicella, in Sant’Ambrogio and dried to concentrate their sugars and flavours. Traditional winemaking techniques are employed and the wine then undergoes 4 years of maturation in large Slavonian oak barrels. This vintage of the Amarone della Valpolicella Classico Riserva Sergio Zenato envelops the palate with layers of mocha, Morello cherries, spices, mint and new leather. It offers a velvety and concentrated palate with lots of dried fruit flavours and sweet baking spices coming through. The wine’s plushness is nicely balanced by its chewy structure and it promises to age well for the next 20 years.